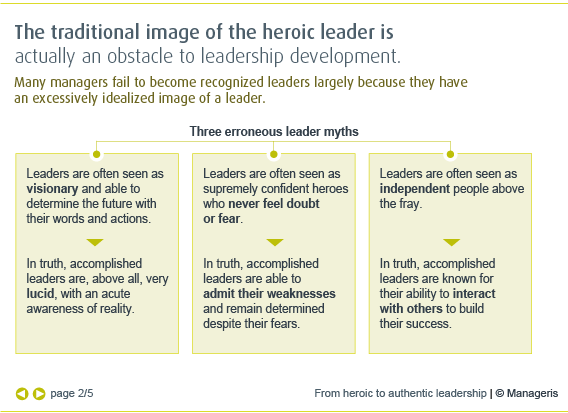 Leaders are often idealized as fearless conquering heroes. 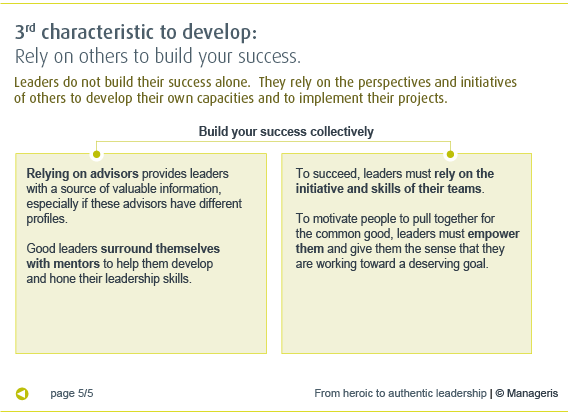 Yet, careful observation paints a very different picture of sustainably successful leaders. 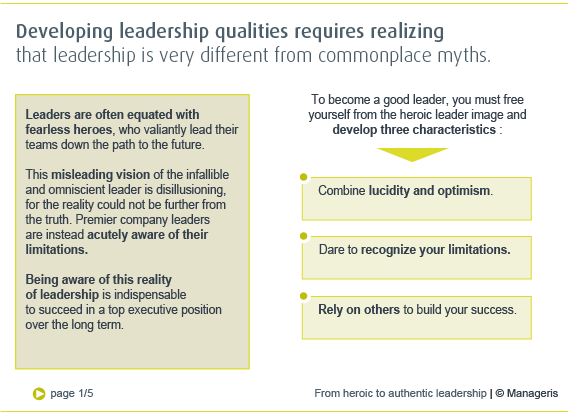 How can we be mindful of the gap between fantasy and reality to develop our own leadership qualities? Leadership gives rise to many fantasies, in large part due to the power connected with it. We more or less consciously tend to idealize leaders as heroes, that is, exceptional individuals above the fray, impervious to doubt and fear, who know the way forward and can thus shape the future by leading others to triumph over adversity. However, the reality is quite different, underlines the author of Better Under Pressure. A leadership recruiting expert at Spencer Stuart, Justin Menkes has studied dozens of CEOs and c-suite executives of top-flight companies to identify what typifies these personalities. His conclusions diverge quite substantially from common preconceptions. Specifically, the best leaders appear to be keenly aware of their own limits, and demonstrate an attitude much closer to humility than to arrogance. Being conscious of the realities of leadership is essential to avoid common blunders made by even the most brilliant and driven leaders. Indeed, the author of Flying Without a Net points out that ambitious people are often easily blinded by the desire to preserve their successful image at all costs, And the delusion that leaders must be infallible and omniscient merely reinforces this tendency. - Adopt a lucidly optimistic attitude. Good leaders focus on their vision, while remaining conscious of unpleasant realities. - Cultivate humility. A decisive factor in the lasting success of leaders is their ability to recognize their limitations and compensate for them. - Dare to rely on others. Working with others helps leaders personally grow and develop and makes their projects more successful. 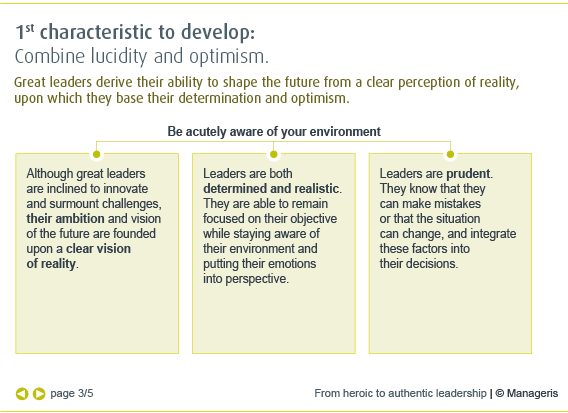 What are the main qualities that characterize leaders? 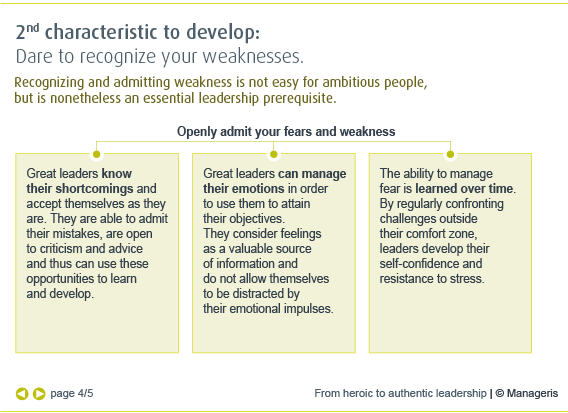 How to address your fears so that they do not obstruct your leadership development? The risk of underestimating the soft skills required to manage change. Thinking of eighteen leaders and professors on the emotional dimension of leadership. Characteristics of a good mentor based on the profile of thirty mentors from Silicon Valley.